No one likes being confused, puzzled or not knowing what is going on. However, it happens to everyone at some point in their life. Perhaps these quotes about being confused will help you feel better about your own conundrum. Here is a collection of quotes about being confused which are grouped into a few different categories. All of the quotes found below are available on sites throughout the Internet, and have been either said by famous individuals or have become famous due to being so widespread. If confusion is the first step to knowledge, I must be a genius. - Larry Leissner. So, now you know some quotes about confusion. Hopefully, these helped to make you feel less puzzled, lost or confused. "Quotes About Being Confused." YourDictionary, n.d. Web. 20 April 2019. 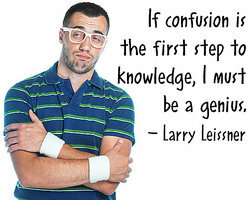 <https://quotes.yourdictionary.com/articles/quotes-about-being-confused.html>.